Do you want to decorate the Christmas tree with green handmade decorations? Here we have for you some practical suggestions! Environmental sustainability is no longer just a trend but a real philosophy of life, so much so that even in the Vatican, this year, they decided to opt for a green Christmas tree. The pine tree decorated in San Pietro Square comes from PEFC certified forests (which stands for “Programme for the Endorsement of Forest Certification schemes”) in the Trento city, it is 25 meters high and it is an age of 80 years. The day when the tree was cut, with a symbolic and educational value, there were planted 49 others between fir and larch from a school of Valsugana. A great news that we spread with pleasure, even in this time. We can have our green christmas tree too: how? By adopting some innovative ideas and, especially, using recycled materials. We start from the real plant. Do you have a garden and a pine or a fir tree? You’re really lucky! Adorns this tree already planted, pulsing with life, it is not much better than a fake or plastic tree? If, unfortunately, like most of the people, you cannot have a natural tree, make sure that it respects the rules of the European Community. 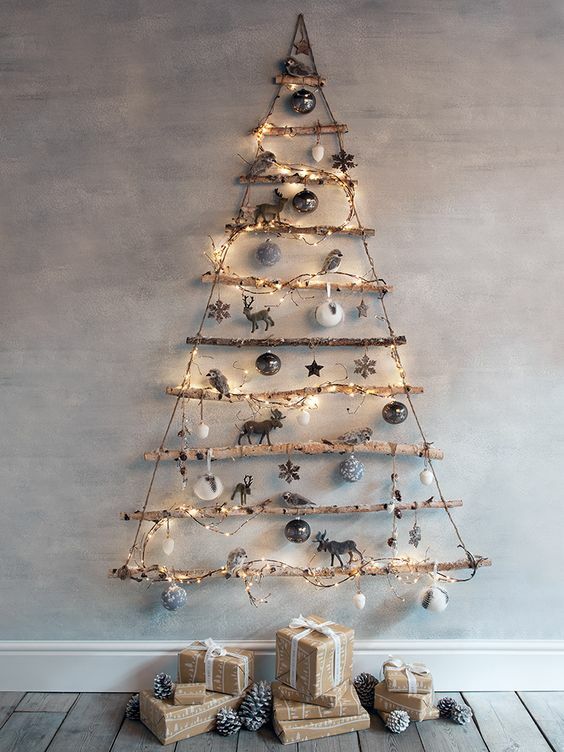 In addition, if you are a creative person, you can try creating a handmade tree in an original way: you can start with something simple using cardboard, clipping two pine silhouettes and put into each other for a 3D effect. Or, if you have a free wall in the room, you can create a picture in relief, availing of wooden poles to be aligned on one another, starting from the longest and ending with the shortest, and decorating the sides with bows and balls of color you prefer. 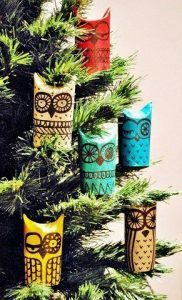 There are many variables and you can really create an eco-friendly Christmas tree with recycled materials! 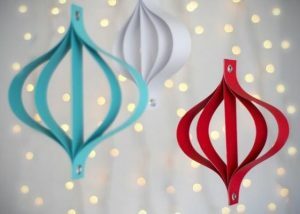 Talking about recycled materials, even tree decorations can be made in the same way! We can recycle the magazines to make small festoons: cut the pages of magazines in many strips of the same length and width. Glue them two at a time to make them thicker and then paint them with tempera. You can give the shape you prefer to the strips: stars, concentric lanterns, circles etc etc. Another idea is the decorations with felt: to make balls, for example, you can use the newsprint pages, crumpling them, giving them a spherical shape, and enclosing them with pieces of felt. On them we can attach buttons and beads. And what do you think abot owls? In recent years they are very trendy, even on the Christmas tree! You need a cardboard tube (such as toilet paper), glue or tape paper, tempera and, if you have them, even sequins, buttons and beads. Just crush one of the ends of the roll and knead to form a base with two ears at the sides: the two sides of the roll can be bonded with the paper tape or the glue. Then colour the owl and draw eyes and feathers, or recreate them with buttons and beads. The ecological tree does not only good for the environment but it can also be an exciting family time: you can involve children, relatives and friends to share moments of fun. And under this green Christmas tree what gift? We recommend OllyNatural Face, Body and Hair treatments: they are good for the whole family because they are cosmetic and hygiene products made with organic ingredients, ICEA certified and dermatologically tested. For a truly green Christmas!